This is the tournament the LRTA runs in years when there are no World Championships, so in early May the top eight players from around the world available to play met at Holyport for some top class tennis. The format was the usual one of two round robin groups of four, with the winner of each group meeting in the final. With Claire Vigrass in Australia, the field was open, with Sue Haswell, Penny Lumley and Sarah Vigrass within a whisker of each other on handicap and the young Tara Lumley only five points behind. It got off to an exciting start, with the longest match of the tournament, a two hour battle between local girls Jill Newby and Tara Lumley, full of long rests. Jill began very well, serving and placing the ball well to take the first set to love. She took the first game of the second set to love, but then Tara found her form, her cross court returns of serve and her two handed backhand being particularly effective. Jill had a number of near misses and the score was 5/1 to Tara, Jill fought back to 5/2 and then, after several deuces and long rests to 5/3 but Tara kept her head and took the set 6/3. The final set was hard fought, with one game lasting 15 minutes, Jill never gave up but Tara was on form and won it 6/2, to take the match 0/6, 6/3, 6/2. At the very end Jill stretched to return a ‘funny’ bounce and although that produced a winner for her, it did for her hamstring, so very sadly, she had to withdraw from the tournament after the match. Next up were Penny Lumley and Louise Mercier. Although Louise gave it her all and produced some winners and some great retrieves, Penny was just too good for her, winning 6/0, 6/0. 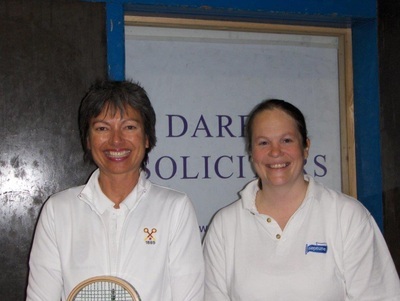 After that Sue Haswell took on Jess Garside in a match of good rests with strong groundstrokes and volleys from both both players but Sue usually had the last word and won 6/0, 6/2. 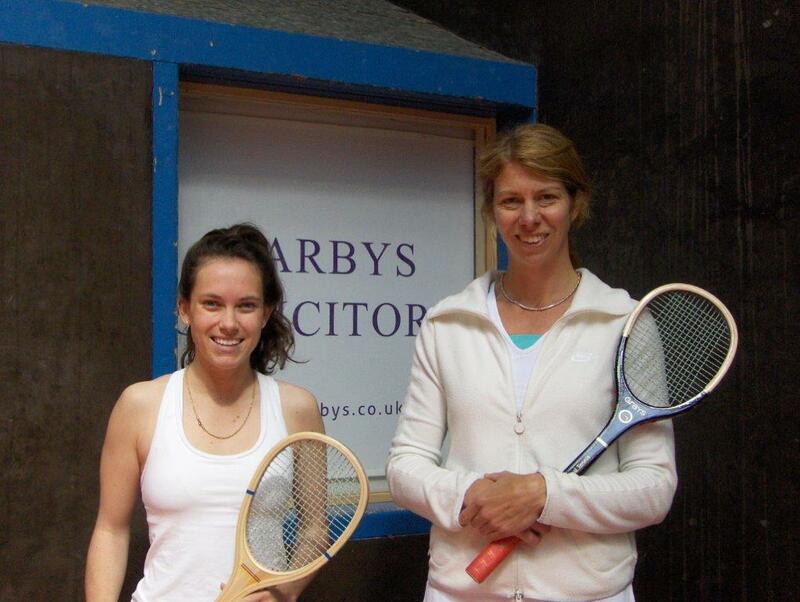 The last match on the first day was Sarah Vigrass against Caroline Janes. Both are strong hitters of the ball and there were some fast and furious rests. Caroline played above her handicap, making some fine retrieves and, with her two handed backhand half volleys, managing to return many of Sarah’s fierce returns of serve. But Sarah was too good, serving well, finding the grille frequently and playing a lovely length and she won the match 6/2, 6/2. On Saturday each player had two matches, an extra test of fitness. The morning started with Penny against Jess. The latter was feeling decidedly under the weather but Jess got herself on court, did not let that show and did herself credit, producing some lovely tennis. But Penny was too good and took the first set 6/1. Jess came back to take the first game of the second set but Penny did not let her get another and the match went to Penny 6/1, 6/1. Then came Sue against Louise. 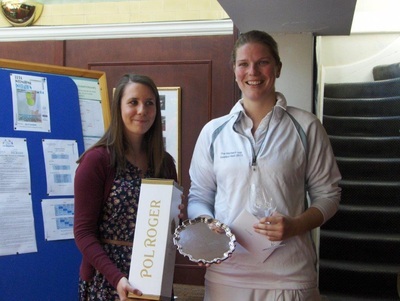 Sue’s power, cut, length, placing and consistency meant that although Louise played her best, Sue always had an answer, winning 6/0, 6/1. The next match, Tara v Caroline, was closer than the score suggests. Both used their doubled handed backhands to produce some fearsome shots, they both retrieved well so that points those in the dedans thought must be over were not and play continued, and there were many excellent rests. But Tara came out on top, serving well, finding the base of the tambour on many occasions and generally cutting and placing the ball effectively. The result was 6/2, 6/3 to Tara. Jess and Louise then faced each other. The first set was close, Louise was leading 5/3 and had some set points but Jess defended them and fought back to take the set 6/5. After putting so much into the first set, Louise was then running on empty, Jess took advantage of this, using the corners and won the second set 6/0, leaving Louise exhausted but determined to get on court more often in future! With Jill unable to play, there were only two more matches in the day and the winners would go through to the final-so there was everything to play for. The Group A decider was Sue against Penny and this was only the second three-setter of the tournament. The tennis was of a very high standard, a match full of good, long rests, with both players covering the court well. In the first set Penny seemed a little tentative and Sue was on top, winning it 6/1. Penny then changed gear and played more attackingly, taking the first two games. Sue won the next and had game points in the following game, but Penny defended them, took the game to lead 3/1 and went on to win the set 6/1. Penny continued the attack in the third set and after some super tennis from both players, Penny was 5/2 up. Sue successfully defended three match points but Penny converted the fourth and took the match 1/6, 6/1, 6/2, after an hour and a half of great tennis, during which Penny got the first winning gallery of the tournament - finding an amazing angle from the backhand side of the court. This meant that Penny was through to the final, could Tara do the same and make it an all Lumley final? 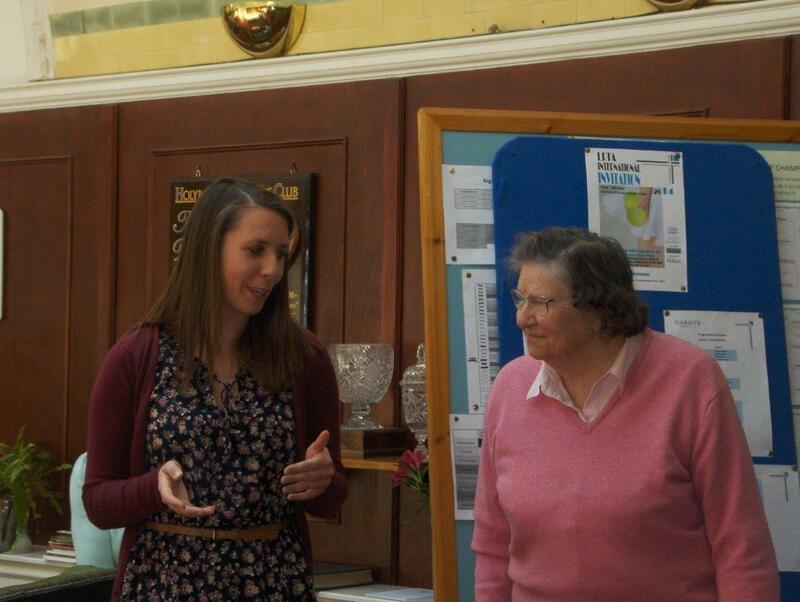 To do so she would need to beat the more experienced Sarah, who was five points better than her on handicap. Tara didn’t let any nerves she might have show and played very well against such a tough opponent. The first set went to 2/2, but then Sarah’s power and experience began to tell and she took the next 4 games and the set 6/2. In one game, when Tara was at the receiving end, unusually there were two ‘chase-offs’. The second set also went to 2/2, with Sarah then pulling away to 6/2, after a long, hard rest which proved to be the final point. These two sets lasted an hour, an hour of excellent, fast, powerful tennis, with the dedans in awe of shots and retrievals from both players. So all was set for the final: Penny, who won the first ever LRTA International in 1998, and then the next three (in 2000, 2002 and 2004) against Sarah, who had not even taken up the game when Penny was winning her first two Internationals! In the first set Sarah was in command, using her high side wall serve to good effect, varying the pace of her shots from fearsomely fast to ‘touch’ and placing the ball well so that although Penny had game points in the second game, Sarah didn’t let her convert them and took the set 6/0. Penny fought back in the second set, increasing the pace of her shots, serving more effectively and went 2/0 up. She had game point in the next game but Sarah defended it, took that game and the next. At 2/2 Penny again had game point but Sarah’s railroad got her out of trouble and then it was 3/2 to Sarah. Both were playing at full stretch, with impressive shots, retrieves and long rests. Penny got to 3/3, converting her second game point with a lucky ‘bounce’ off the net into the hazard court when defending a last gallery chase. After more fine play it was 4/4, and then Sarah was 5/4 up, but Penny kept in there, she defended a match point and took the score to 5/5. The dedans were on the edge of their seats, hoping for a third set but Sarah had other ideas and after losing another match point, was able to convert the next one to take the set, the match and the tournament 6/0, 6/5. Sarah and Penny gave a wonderful display of tennis, Sarah’s consistency, strength, accuracy and variation of pace, especially her shots to the base of the tambour in the end proving too much for Penny, whose play belies her years, no one watching the match would imagine that Penny is within a whisker of being twice Sarah’s age! 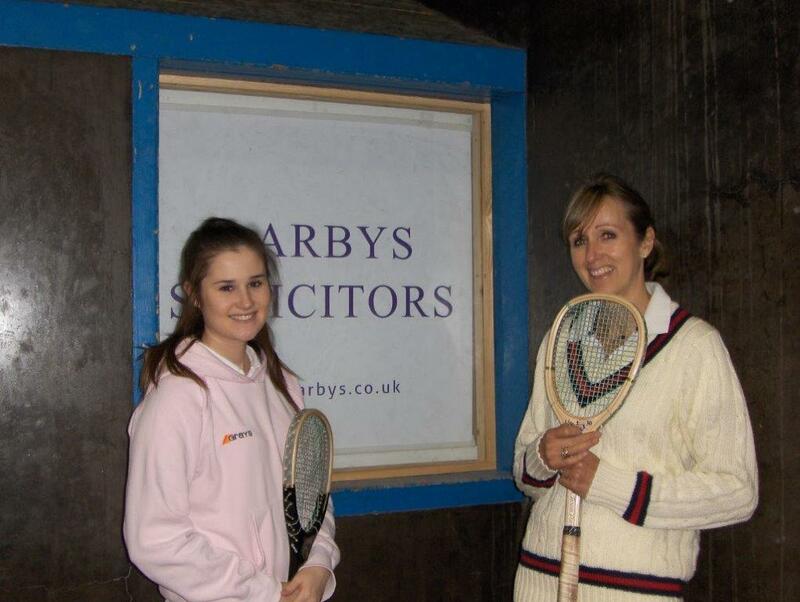 The LRTA would like to thank Darbys, Solicitors for their sponsorship, which was very much appreciated. It is the first time that Darbys have sponsored real tennis and we are delighted that they will continue to support the ladies’ game. 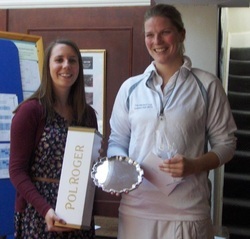 It was good to see Rebecca Kashti watching the group matches on Friday and thanks go to Jane Bedford for coming to the final and presenting the prizes, we hope that Jane will be tempted onto the real tennis court herself ere long. Thanks too to Pol Roger, the champagne it provides for the winner and finalist is always well received and appreciated. 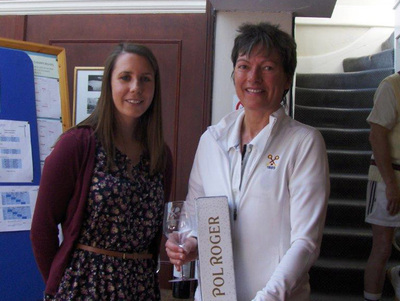 Pol Roger is a longtime friend and supporter of the ladies’ game and the LRTA is most grateful to it. Many thanks are due to Holyport for hosting the tournament, giving up the court time over the three days and making us all feel so welcome. Jill Newby, as well as playing, did a wonderful job as regards the catering, her cakes were superb (who needs Mary Berry!!). Many a time one heard ‘I shouldn’t, but it looks so good…..’ as another slice of cake was cut! And the Sunday lunch was delicious - thanks, Jill. Thanks must go to Tom Durack, who marked all the group matches, so had a particularly long day on Saturday but looked just as fresh and cheerful at the end as he was at the start of his marathon of marking, and to Andy Chinneck, who marked the final. Finally, thanks to Sarah McGivern for all her work on the programme and to Lucy Hutchinson and Sheila Macintosh for organising the tournament.